Most everything in this new home in the Woodland Heights neighborhood of Houston is sleek and white. 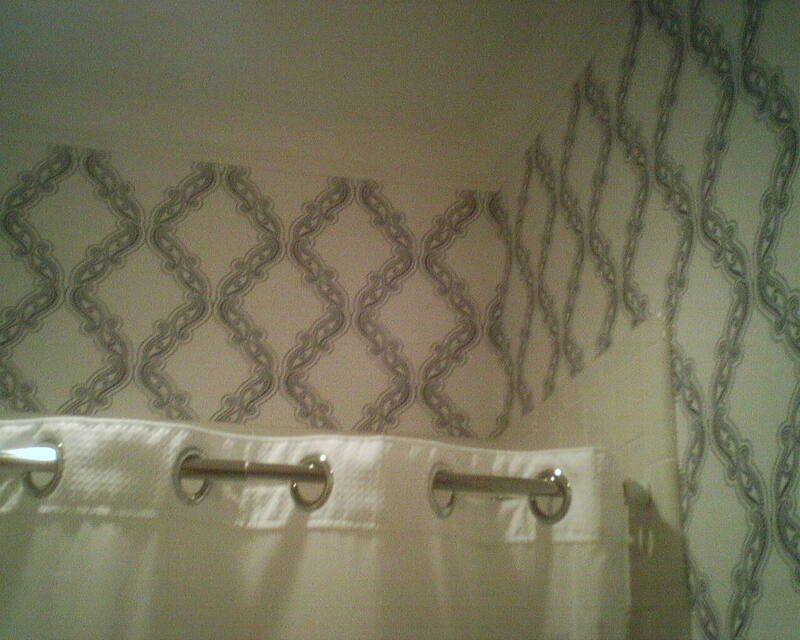 The homeowner wanted to add just a little pizazz to the hall bathroom shared by her two young daughters. 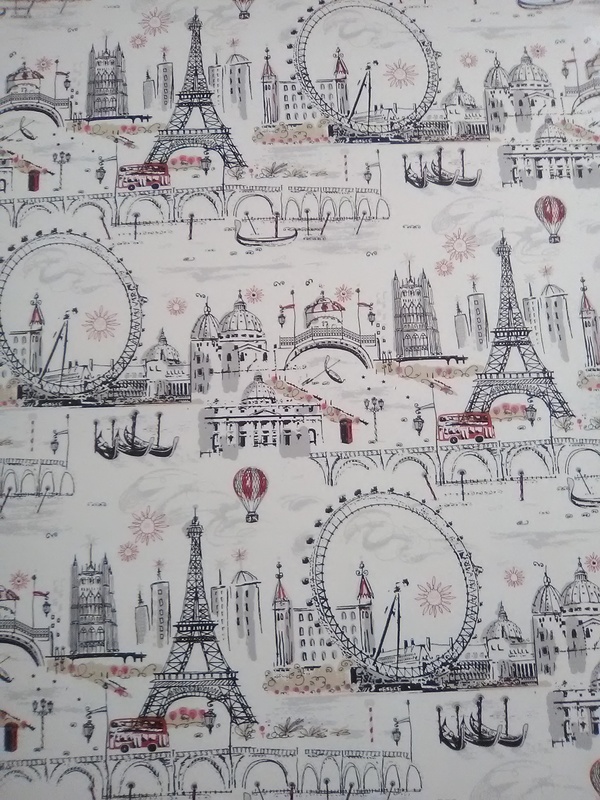 This Paris-themed design, with its pencil-thin lines and three-color palette is just perfect! 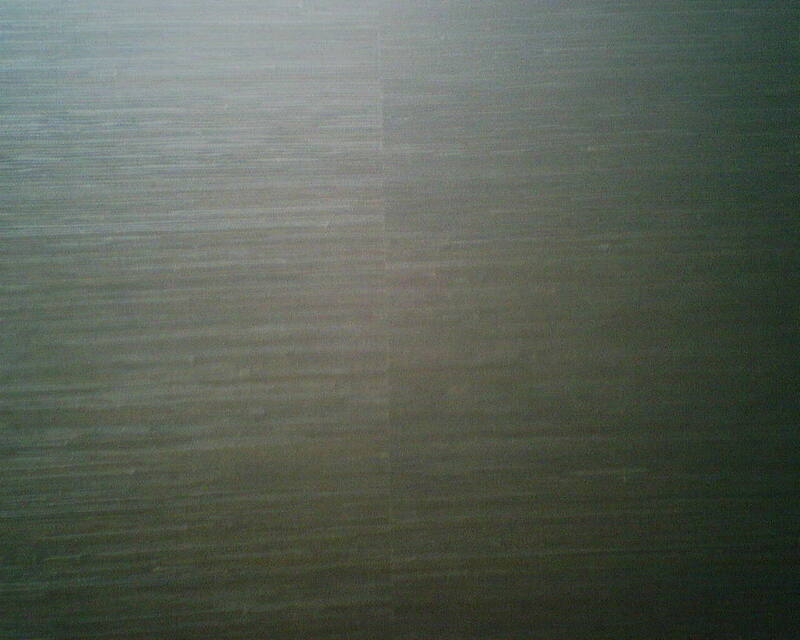 I love the way the line drawing effect reiterates the lines in the shower’s subway tile. Charcoal grey, white, and just a touch of red are enough to brighten the room, without overwhelming the serene white color scheme. And it’s a fun design to look at. I mean, who wouldn’t love Paris – especially a Paris with a Ferris wheel? 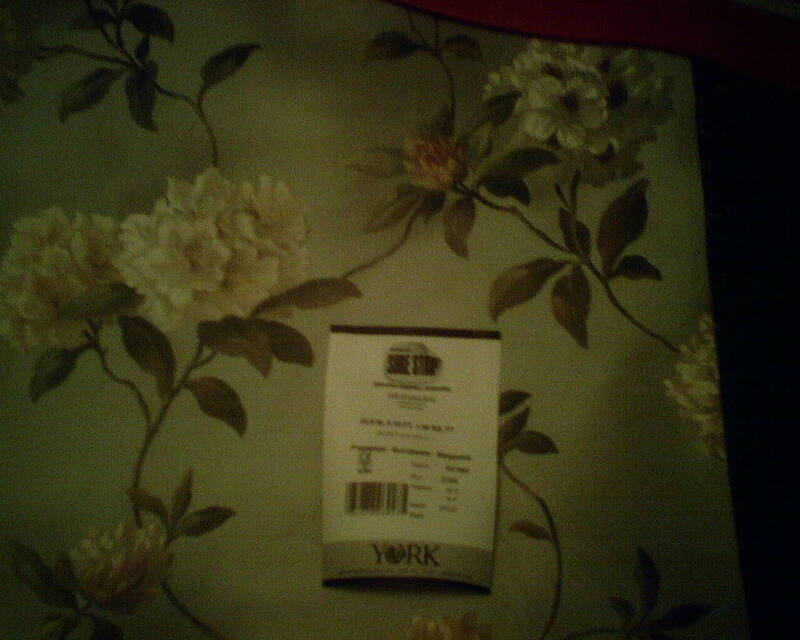 The wallpaper is by York Wall, in their Sure Strip line, and is a pre-pasted product on a thin non-woven backing. 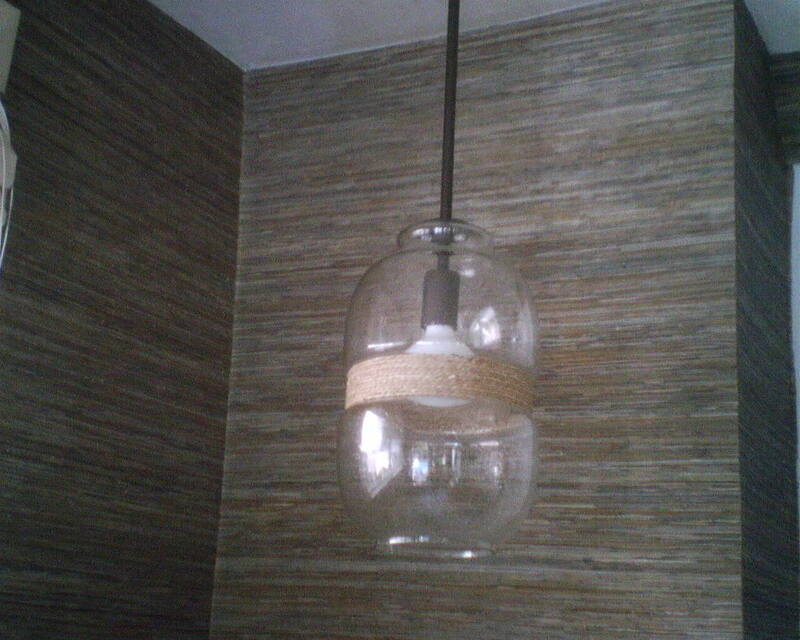 It is designed to strip off the wall easily with no damage when it’s time to redecorate. In the meantime, it is thin and hugs the wall tightly, and the seams are practicably invisible. This brand is very reasonably-priced. The interior designer for this project is Stacie Cokinos, of Cokinos Design. Stacie specializes in helping choose floor plans, finishes (flooring, countertops, paint colors), fixtures (faucets, lights, knobs), appliances, in new home construction and in remodel projects. Her look is fresh and clean, but very livable for modern families. She is a delight to work with. The homeowner said I put this paper up about 20 years ago. It is what we call a British pulp paper – paper, not vinyl and not vinyl coated. In a few areas near the ceiling, the paper has started to pull away from the wall. It was only over the shower and tub areas. What does that tell you? Yes, humidity is the great enemy of wallpaper. Especially when you have teenagers taking steamy, hour-long showers. This was pretty easily fixed, by repasting the wall behind the loose areas, and then smoothing the paper back into place. Here is a large powder room (with shower!) in a new home in the Houston Heights. 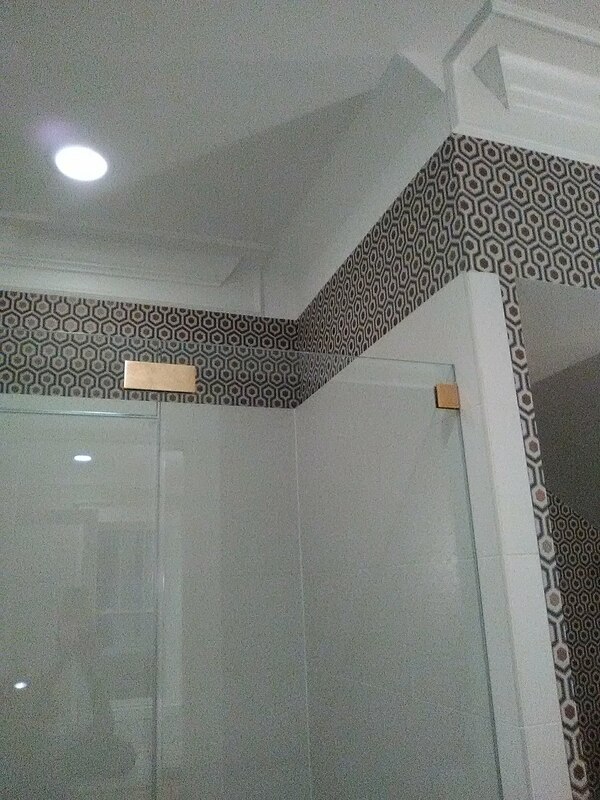 One wall inside the shower enclosure was under the stairs, so it had a short sloped area. 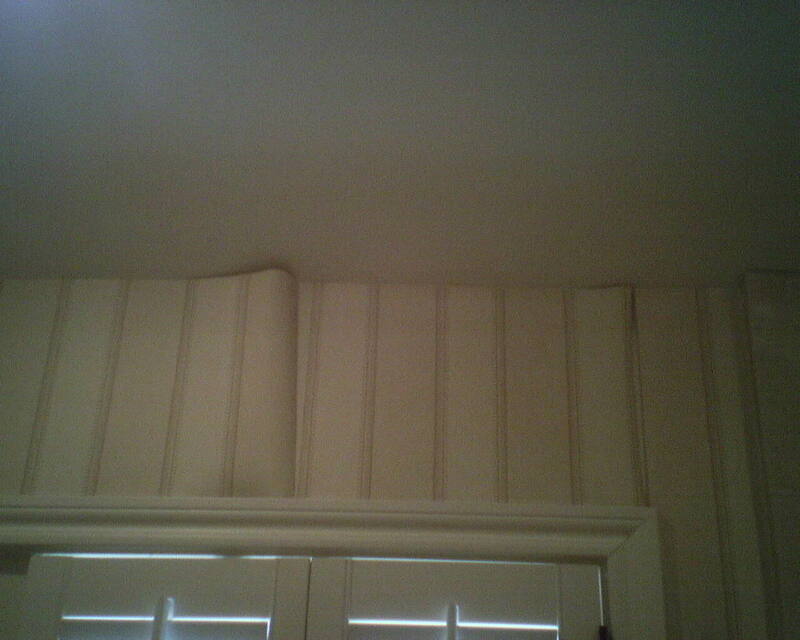 There was also some vertical wall – but it rose higher than the crown molding that ran around the rest of the room. The dilemma was which surfaces should be covered with wallpaper? Paper the horizontal wall up to where it meets up with the sloped wall? Paper the sloped wall? Paper both? Paper neither? Choose a coordinating color and paint one or more areas? In the end, I chose to run a horizontal line between the crown molding on the left and the molding on the right, and then stop the paper at this line. It doesn’t cover the whole wall space, but from down on the floor, your eye doesn’t catch this. 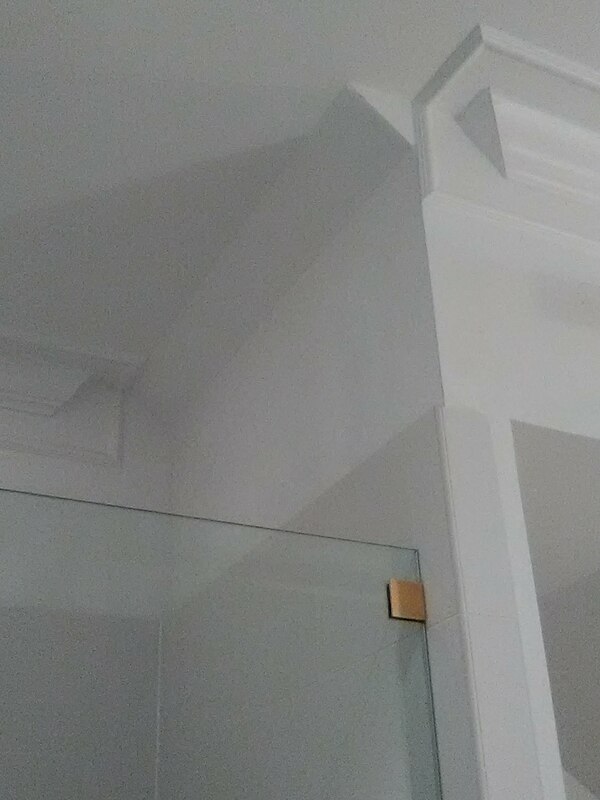 And I think it looks much better to maintain the horizontal line of the paper ending at the bottom of the crown molding, so it is homogeneous all the way around the room. 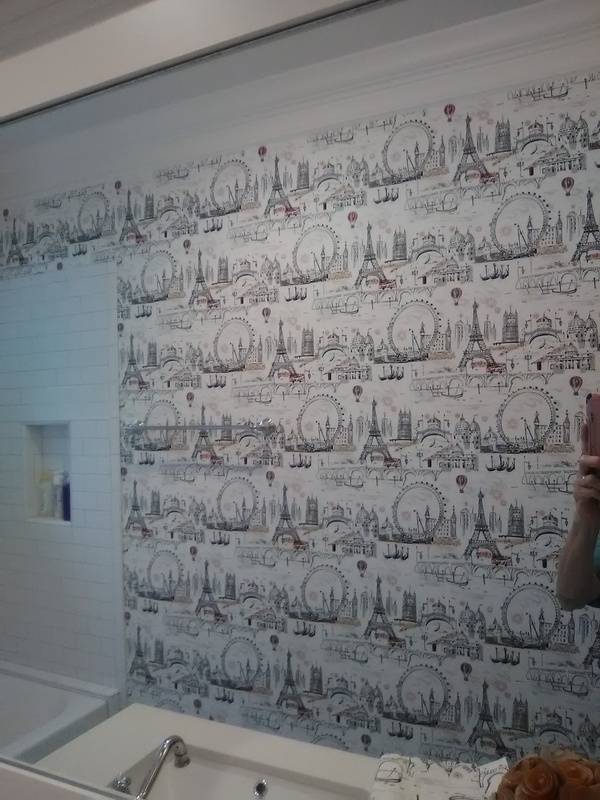 This wallpaper is by David Hicks, for Cole & Son, and is called Hick’s hexagon. Here is a classic ogee design. That means that the pattern has a continuous mirror image double “S” curve. 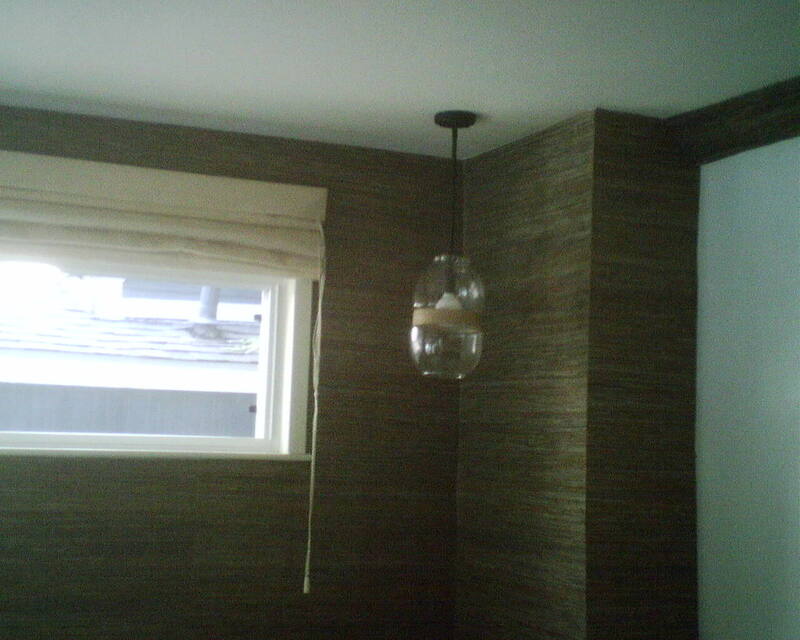 The interior designer on this project is Pamela O’Brien of Pamela Hope Designs. 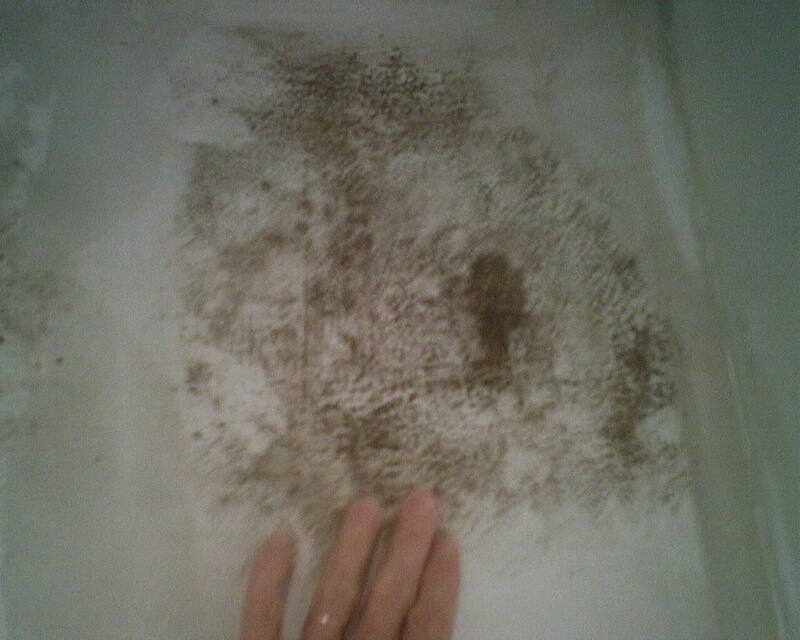 I removed a strip of paper-backed solid vinyl wallpaper from the wall over a shower in a room used by two teenagers. The type of paper (one of my least favorites), the humidity from the hot and heavy shower usage, the lack of primer used by the previous installer, and an exterior wall that most likely had some moisture problems, all added up to a recipe for mildew. I used bleach and then another mold / mildew product to kill and remove the mildew, then went over it with an oil-based stain-blocking sealer called KILZ. Over the KILZ, I added a coat of wallpaper primer. The two primers that I use most are the large cans in the last photo, and they each are used for different circumstances. So today I was hanging paper on the wall above the shower. I looked down to see a wasp clinging to the white tile directly below me. No biggie, I thought… When I get down off the ladder I’ll see if the homeowner has a flyswatter. 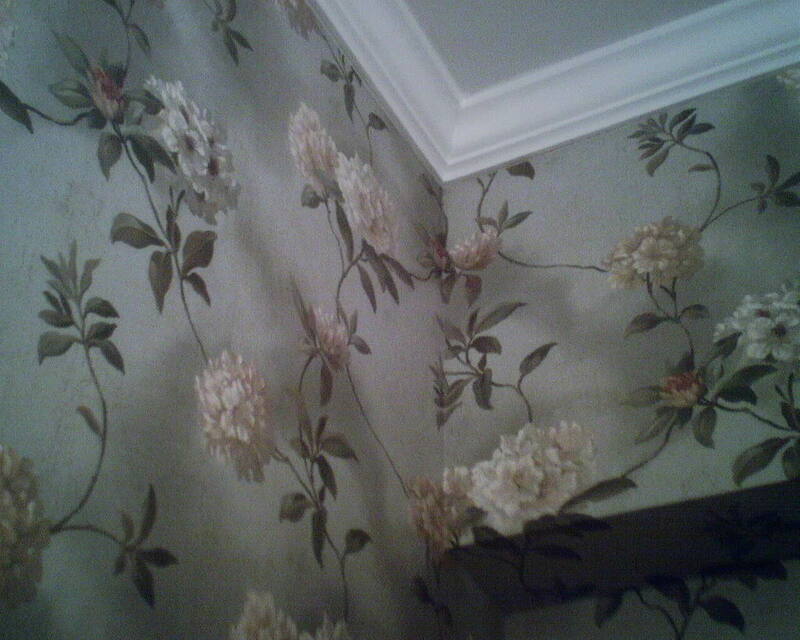 I was still maneuvering the wallpaper when I noticed that the wasp had flown away, and landed on an opposite wall. Fine. No problem. He will eventually find his way outside. I was just about to finish up with that strip of wallpaper, when I felt something on my leg. I figured it was a thin piece of wallpaper that had been trimmed off and fallen from where I was working, somehow landed on my leg and stuck. But it kept moving. I looked down – and danged if that dad-burned wasp wasn’t on my leg, squirming all around! 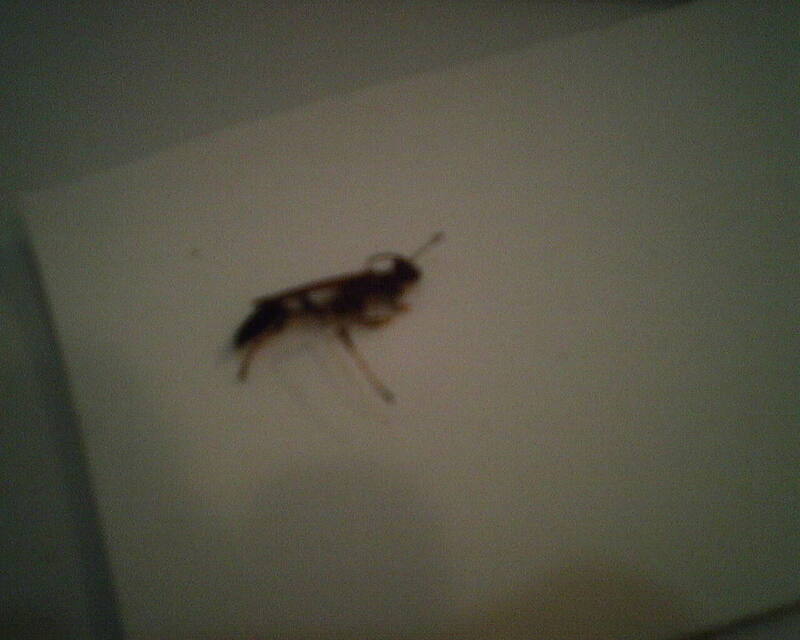 His stinger came out, but by that time he was on the cold hard tile floor of the shower, impotent. My leg was miles away. I hung a woven grasscloth in this TV room / sunroom in an older home in the Rice Village area of Houston when the homeowners first bought the house – back in 1992 ! 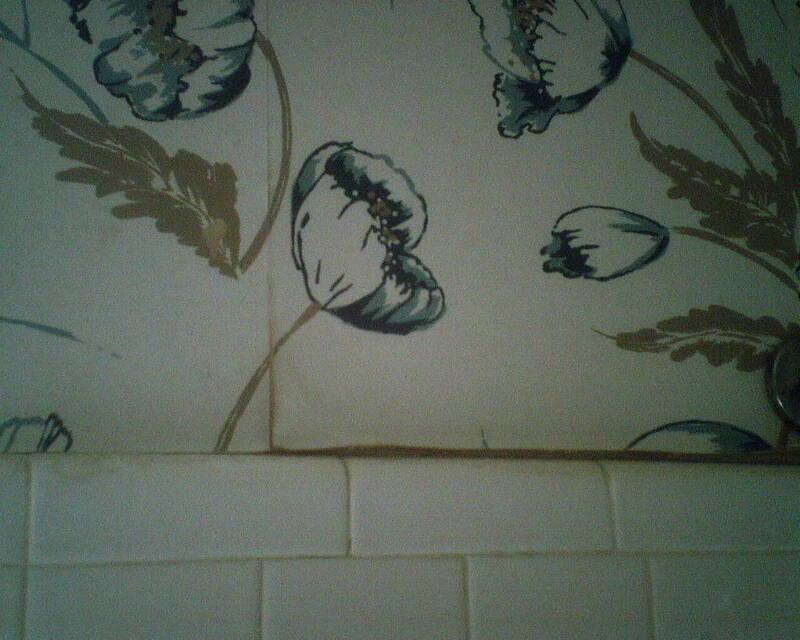 The wallpaper was still in great condition – except for where shower pan in the upstairs bathroom had leaked, causing damage to the wallpaper below. The paper had suffered fading from the abundant sunlight in the room, too. Time for a change. The homeowners considered other types of paper and patterns, but came back to the natural, earthy, textured look of grasscloth. 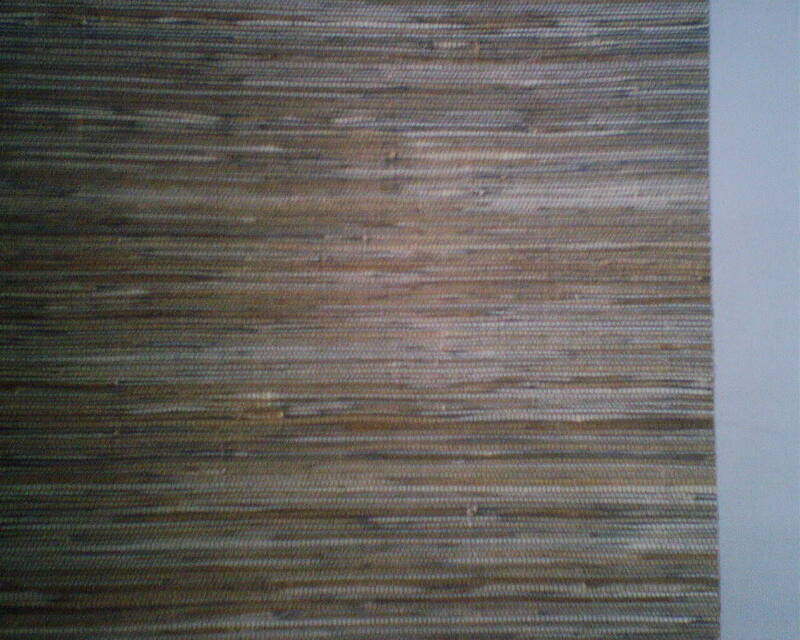 Their new choice is more relaxed than the previous woven one, and has more color – although it’s all in the neutral / brown / tan scope. I was pleased that there was minimal shading / paneling (color variations between strips) (see 3rd photo). The material has a lovely texture (last photo), and was reasonably easy to trim and position. There was no brand name on the product label, but it was bought at below retail price from Dorota Hartwig at Southwestern Paint on Bissonnet near Kirby. (713) 520-6262 or dorotasouthwestern@hotmail.com. She is great at helping you find just the perfect paper! Discuss your project and make an appointment before heading over to see her. 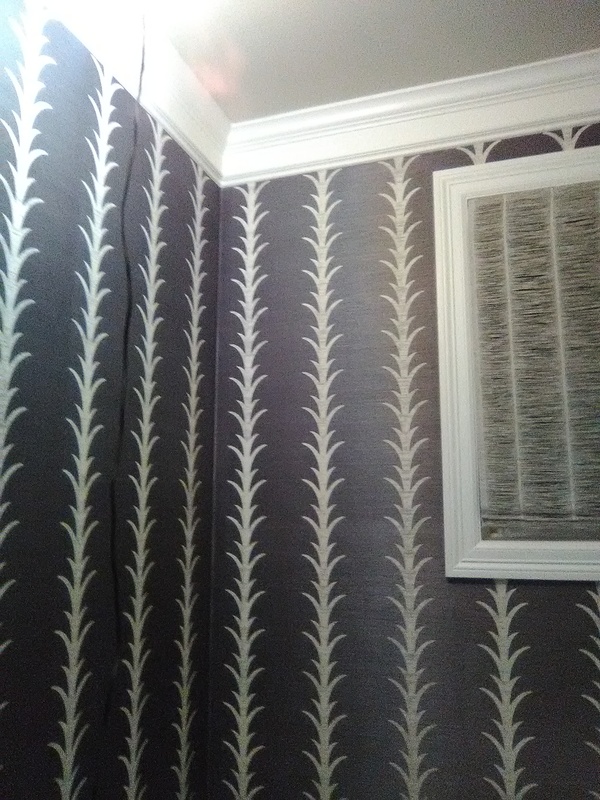 On the more traditional side, this flower-and-branch pattern worked beautifully in a master bathroom in an early 20th century home in the Montrose neighborhood of Houston. The bathroom had been redone, including new slate-grey tile around the shower; the wallpaper coordinated beautifully with the tile. The homeowner loved it. He kept saying that it was the best decorating dollars he had ever spent, and that he would have to spend the night in the bathroom, because he wanted to be able to see it every time he woke up. The pattern has an interesting shadowed effect – it looks as if light is coming in through windows and casting shadows on the wallpaper. This is a good example of why you should always look at room-set photos on-line and in the selection books, so you can see how the pattern plays out on a large scale. 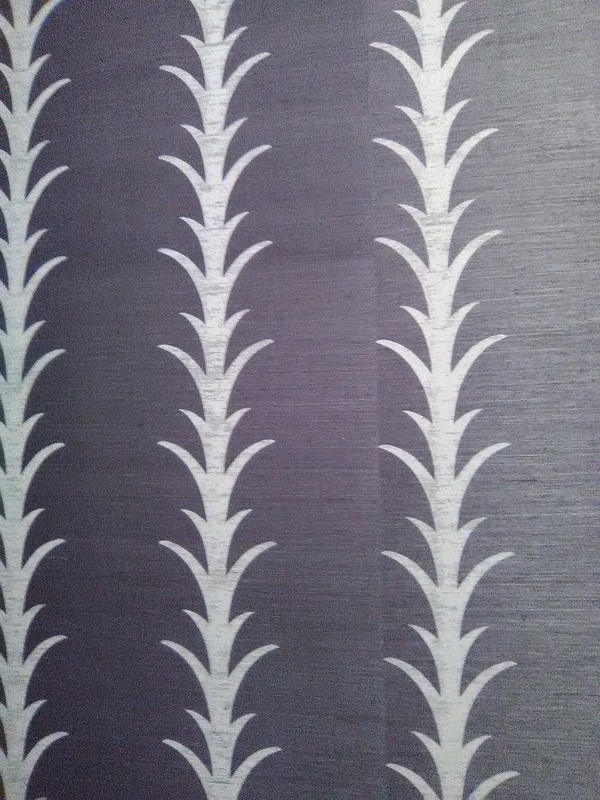 If all you saw was a 10″ sample, you would not realize that the overall pattern included this shadowy look. 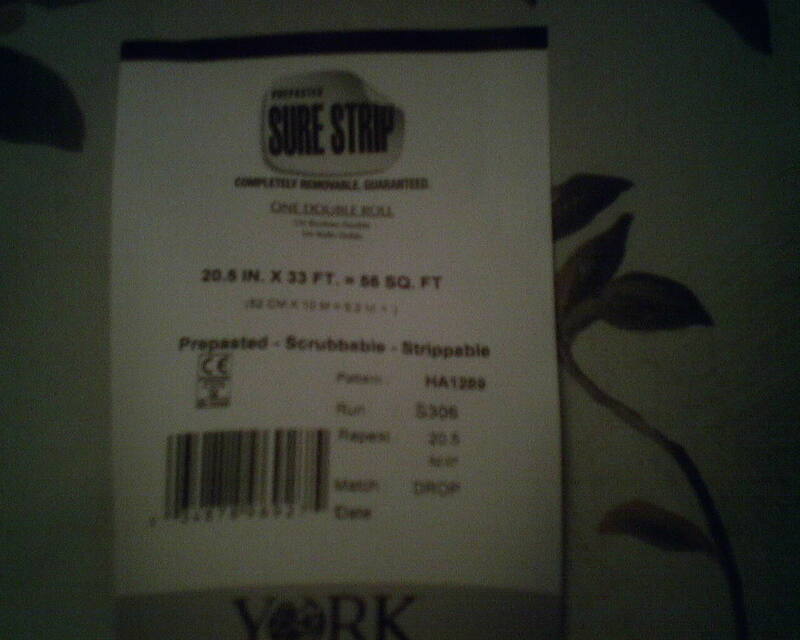 This wallpaper is by York, and is in their SureStrip line. I really love these ShurStrip papers. They are the newer non-woven materials, but are thin and easy to work with (as opposed to some that are thick, stiff, spongy, and … er… icky), and will hug the wall and stay in place without peeling or curling for years to come. They are also designed to strip off the wall (relatively) easily, when you are ready to redecorate. Oh, boy. I sure don’t like vinyl papers that are bonded to a paper backing. Here is a very visual reason why – Under humid conditions, they delaminate (surfaces separate) and curl. This particular type of paper is about my absolute most detested, because of it’s propensity to curl. The material is typical of what was hung back in the ’70’s. Other issues factor in, like the type of primer used (or not used 😦 ), the paste used, type of paper backing, type of vinyl surface, age of home, ventilation in the room, and just how much steam is generated when the shower is used. 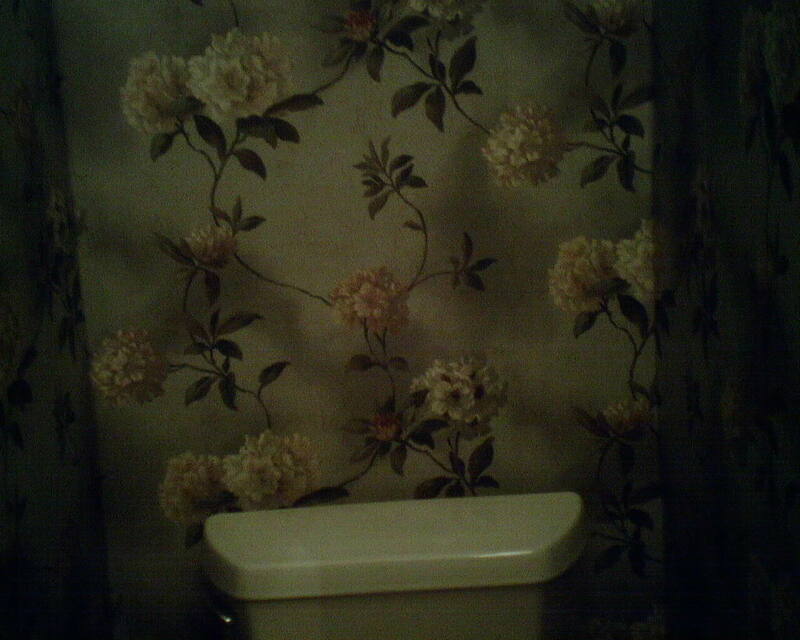 To be fair, this wallpaper had been up and looked good for a long, long time (possibly back to those ’70’s!). So maybe Father Time is just taking its toll. And maybe Father Time has an ulterior motive … I mean, look at that paper! Isn’t it about time for a little update?! !